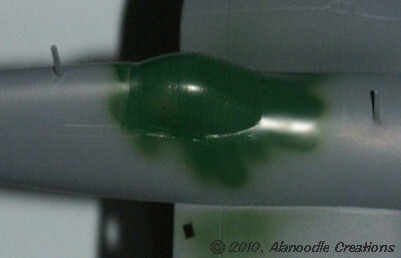 Before applying the plane's main color, the canopy straps were airbrushed with the same Park Green, Flat Black mix used on the interior of the cockpit. Once the main color was sprayed on, the insides of the straps would be dark green and the outside would be the color of the fuselage. 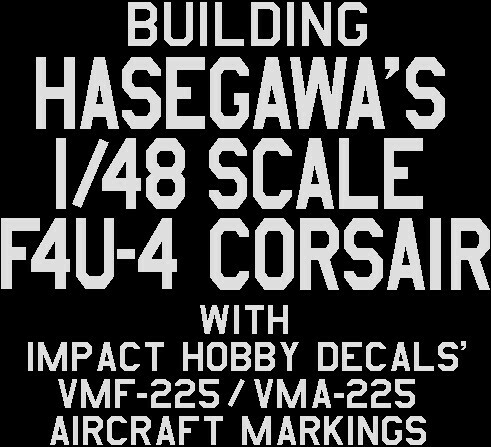 According to the reference sheet that came with Impact Hobby's decal set, postwar Corsairs of the U.S.M.C. VMF-225 Squadron were painted overall "dark sea blue." A 4:1 mix of Tamyia's Sea Blue (XF-17) and Blue (X-4) was very close to the color of a Corsair in an image taken in 1946, below. The paint was thinned with denatured alcohol and sprayed on using a Testors mini spray gun. Two coats covered the model. One thing I love about this hobby is the continuing opportunity to try new techniques, materials and media. At the same time, I have a bad habit of just diving in without doing any kind of testing or experimenting on scrap material to see how a new technique, material or medium will behave or turn out. The model I happen to be working on at the time winds up becoming my test piece. This can add an element of adventure to a modeling project. To prep for decals, the painted model was sprayed with Pledge Future acrylic floor polish to provide a high-gloss finish. Modeling magazine articles have often mentioned clear-coating models with Future and it was something I had wanted to try. Using the Testors mini spray gun, Future was sprayed on full strength with the regulator on my compressor set at about 25psi and the paint setting on the spray gun set at medium-low. The Future covered very quickly on one pass and no second coat was needed. The first thing I noticed was that the entire surface of the model was covered with thousands of tiny air bubbles. The model appeared covered in a thin layer of foam. Thankfully, the bubbles all settled out in a couple of minutes. I was later advised that my air pressure may have been too high. Once the bubbles were gone, I was able to see a few runs and puddles on the model. I used the edge of a paper towel to wick away as much of the running Future as I could. When the Future finally dried, it had leveled out and left the model with a beautiful, glossy and very even finish ideal for the application of decals. I wanted to build a model that was historically accurate and hoped it might be possible to replicate a plane in my father's squadron, USMC VMF-225. A Google search surprised me. 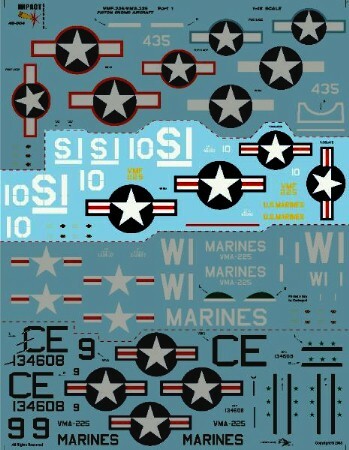 Impact Hobby sells a decal sheet that has markings for 5 separate planes comprising the piston engine aircraft of the Marine Corps VMF-225 squadron. These range from the Vought F4U Corsairs of World War Two to the Douglas A-1H Skyraiders of the Korean conflict. 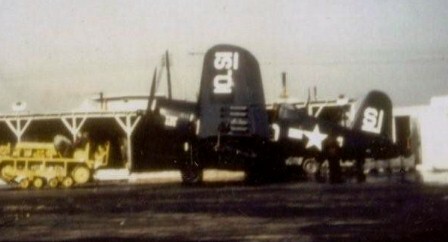 The sheet includes markings for F4U-4 Corsair, bureau number 96082 which was stationed on the aircraft carrier U.S.S. Siboney at the same time that my father was stationed on board. The decal sheet, with artwork by JDMC Aviation Graphics is beautifully printed in 7 colors by Cartograf of Italy. The markings include everything from the prominent "Star and Bar" insignia on the fuselage and wings to the safety labels on the plane's propellers. The sheet can be purchased directly from Impact Hobby Decals. The markings on the decal sheet were extensively researched with the only issue being the "U.S. MARINES" and the "VMF 225" markings which were printed in yellow instead of white. Impact Hobby caught this error and includes an additional sheet with the markings in their correct white color. The locations of the markings would be based on the placement guide provided by Impact Hobby and on an excellent photo of the actual aircraft (above) provided by Dave Gorman, whose father was also a Corsair mechanic in the VMF-225 squadron. Heeding the advice of more experienced modelers, no decal setting solution was used because of the Future clear coat. This was a problem as the decals were prone to "silvering" where a layer of air gets trapped underneath the decal and becomes visible through the clear carrier film. 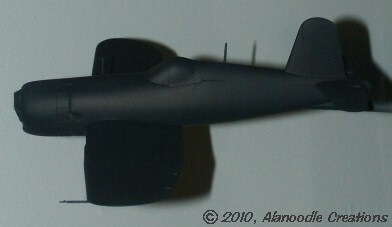 Instead of a decal setting solution, Future was brushed onto the model before laying a decal down. Once the decal was on, more Future was brushed on and gently removed with the edge of a paper towel. The decal softened and snuggled down onto the model like it would if a mild decal solvent was used (see Fine Scale Modeler magazine, July 2010: Using Future for Decaling). When dry, decal edges were hard to pick out. The decals became bonded to the finish. Applying decals to a model has never been my greatest skill. Impact Hobby's quality decals and the Future clear-coat helped to produce a decaling job I'm very pleased with. The model was weathered with a wash of Model Master Flat Black to accentuate panel detail. The Future clear coat was unaffected by the thinned enamel paint. A final coat of Tamiya Clear (X-22) mixed with a small amount of Flat Base (X-21) was airbrushed on to give the model a satin finish. The Parafilm canopy mask was removed by carefully lifting off a corner with the tip of a sharp hobby knife and scraping the rest off with a fingernail. While not a particularly easy process, I find the Parafilm much easier to use and more effective than other masking methods. In order to display the plane "in flight," the kit's nicely detailed four-blade propeller just wouldn't do. 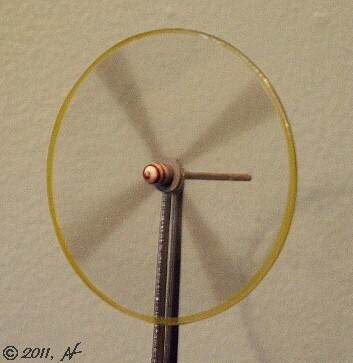 Rather, I would simulate the look of a spinning propeller using a circular piece of clear plastic, my airbrush and Tamiya Smoke (X-19), a translucent grey paint. 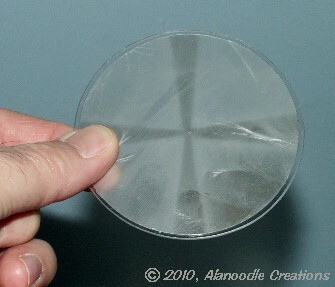 A 3 1/4 inch diameter blank was cut from .040 inch thick clear copolyester sheet using a very sharp Olfa circle cutter. The edge was rounded over slightly with a file. The blank was taped down to a printed pattern like the one on the right which I originally created to get the same effect for my 1/144 scale P-51D model. The outer 1/16 inch of the blank was masked off with Parafilm. Four pieces of styrene sheet were cut with 75° angles (strictly arbitrary) and taped down with a 5/16 inch (also arbitrary) spacer to hold the masks above the blank. The blank was then airbrushed with Tamiya Smoke. Because the sheet styrene masks were placed above the blank instead of directly on it, the edges of the painted areas would be fuzzy instead of sharp to give the illusion of a motion blur. The blank was removed from the template and the Parafilm was removed. 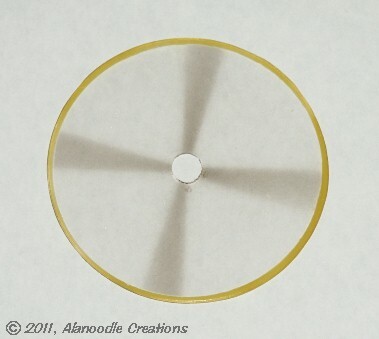 A new Parafilm mask was then applied to the center of the blank and the outer edge of the disk was sprayed with a 2:1 mix of Tamiya Clear Yellow (X-24) and Yellow (X-3). The mask was removed from the prop and the entire piece was finally airbrushed with Future floor polish. The clear disk, made from copolyester had a funny property of causing the Future to bead up on its surface. Needless to say, the first coat wasn't pretty. A second coat covered nicely, however, and a third coat, applied with a half-inch acid brush looked very good. As for the kit's four-blade propeller, the blades were removed and the remaining prop core was super-glued to a prop shaft made from the 0.080 inch diameter wood stick from a cotton swab. By chucking the prop core and shaft in a hand drill and using it like a lathe, I was able to shape and smooth out the core using a file. The clear plastic prop was then glued to a brass ship porthole which fit firmly onto the prop core. The prop core was painted medium gray and the dome was painted gloss white. The Impact Hobby decal sheet includes a straight red line to represent a red spiral painted on the prop hub. 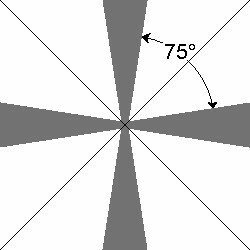 This works well until the stripe reaches the hemispherical front end of the hub where it refuses to follow the curve to the center. The decal was applied only to the edge of the dome shape. 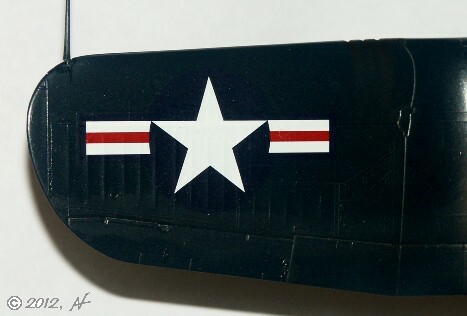 The stripe's color was matched with a 10:1 mix of Tamiya Flat Red and Clear Blue (X-23) and the spiral was hand-painted to the center of the dome. A #46 drill bit (0.081 inch diameter) held in a pin vise cut a hole in the plane's engine where the propeller shaft fits snugly. I like the effect. Strangely, to this day, no one has ever asked me why the propeller blades are a motion blur but the red spiral on the hub appears static. As a final weathering touch, the engine cowling was masked off and exhaust streaks were airbrushed onto the sides of the fuselage using Tamiya Flat Black. Gunfire residue ("GSR" to you CSI fans) was airbrushed around and behind the wing gun ports using a 1:1 mix of Flat Black and Hull Red (XF-09). To simulate the rigging that ran from the aircraft's tail to the mast on the forward fuselage, a small length of sprue, the "trees" that model kit parts come attached to, was heated and softened over a small candle flame and stretched into a long hair-thin plastic filament. It was held into position with super glue. 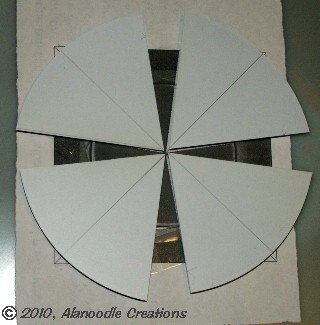 The model is mounted on a base made from a craft-store mirror with an unfinished basswood frame. The frame was modified to hold the model and position a display plaque and clear plastic cover before being stained and covered with polyurethane. A display plaque was engraved by Ed Dietrich of Andrew Lundy Associates and was scanned to become the chapter header just over the photo of the finished model, below. 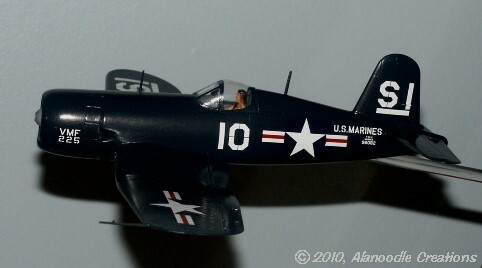 The Corsair took about 15 hours to build and paint. Many of the kits I've built required extra work just to correct engineering problems like bad part fit or molding issues. I was pleased with how easily this one went together. The challenges this model presented were mostly in the detailing, painting and finishing and actually helped to make this a very enjoyable project. The model was presented to my father on Fathers Day, 2011. Special Thanks to Dave Gorman for some excellent photos which helped to create a historically accurate model and as always, thanks to Sharon L. for being supportive and putting up with my occasional single minded obsession with whatever it is I happen to be obsessing about at the moment. 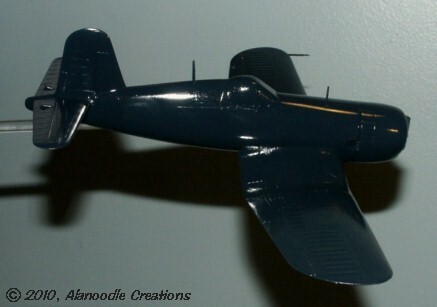 Click on the picture of the finished model above to go to the F4U-4 Corsair Gallery page.